Measurements: 2.75 x 4.38 inches, or 70 x 112 mm. Back of card: Dull red gingham, ie, that oilcloth crosshatch pattern. Book included: Yes, 96 pages, 3.1 x 4.38 inches, or 79 x 111 mm. Illusrated, printed in red & black inks. Instructions in English only. Black spine, rounded corners, resembles a small notebook. Publisher: Quirk Books of Philadelphia. Printed in China. Comments: The deck comes in a receipe box, ie, a small file box measuring 3.5 inches deep, 2.8 inches high, and 5.75 inches wide, which is 90 x 71 x 145 mm in metric. It is a box with a close-fitting lid, not a flip top. Inside, a black felt plastic insert separates the major arcana from the minor arcana, with the instruction book bringing up the rear. There are nice tab dividers separating the three. I wish you could flip through the cards in the box, as you could a regular recipe box, but the insert that holds everything in place won't let you do that. Even so, A++ for packaging. This deck is intended for the newly married 1950's housewife. It made me think - a lot - about the very first tarots. If you're a young woman in the first days of marriage, or a young Italian prince looking to get on in the world, a handy set of cards could be a useful guide. The Housewives Tarot is a striking reminder of just how immediate tarot once was. The Fool, for example, is YOU. You, the prince, you the new housewife. The very next card, The Magician, holds out the false hope of an easy path. In the Housewives Tarot, it's the appliance salesman who will make household drudgery disappear. This is the best depiction of magician I have yet seen. Yes, the appliances he peddles are magically useful & efficient, but instead of saving labor, magical gadgets merely set household standards ever higher. As shown by the very next card, the Empress, the Ideal Housewife, with her Recipie for Success, the imaculate table, the four food groups, her wise stewardship. Only two cards into the major arcana, our Fool is already a little less foolish & a little more wise. She is quickly learning the housewife's world to be full of traps & pitfalls. And on it goes. The Emperor is Chef Boyardee Man (ie, the world of canned & prepared foods), the High Priestess is Aunt Jemima (called "Secret Syrup"), the Hierophant is a TV with a test pattern, the Lovers are the pre-wedding romantic days, cruising in a car, the Chariot is a station (estate) wagon, the Hermit is your private bath, Death is a jar of salmonella-laced mayonnaise, etc. The Hanged Man you can see, above. The juxtaposition of clothesline, hanged man, and female underwear, is brilliant. 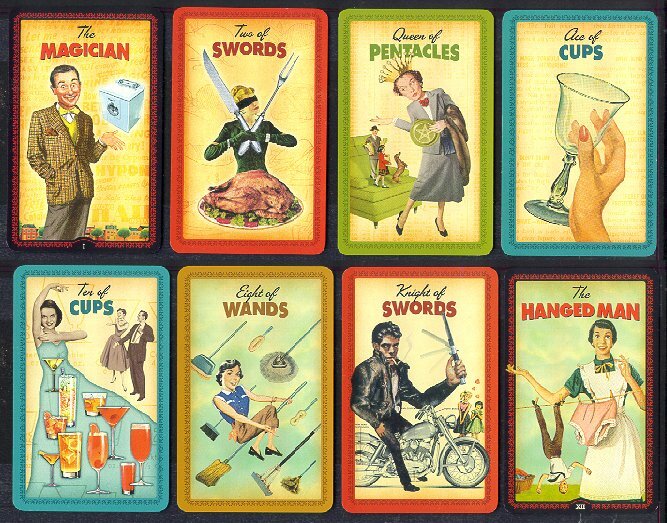 In this deck, Swords are household knives (including the King's shish kabob skewer), Pentacles are dinner plates, Cups are filled with booze (except the 6 of Cups: Lemonade, a reminder of youth), Wands are cleaning implements. The housewife's mastery of each suit is shown by the Queens. Her lout of a husband is shown by the Kings, the exciting lovers she gave up to get him are the Knights, and Pages are her mischievous children. In sum, as tarot, and as an overall concept, this is one of the very best decks I have seen. That it comes not from a major tarot house, but from a quirky publisher in Philadelphia, is all the more surprising.